Shares in Spire, the UK private hospital chain, jumped 15% after it rejected a bid from South Africa's Mediclinic. Spire shares were trading at 300.9p, above the 298p price implied by Mediclinic's offer. Mediclinic, which has a stake of almost 30% in Spire, said it was considering its position. 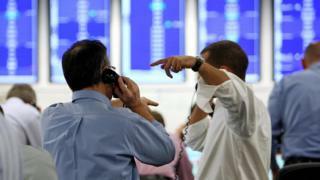 The rejection came on an otherwise quiet day on the market, with the FTSE 100 closing up 1.22 points at 7,524.45. Elsewhere, a profit warning from car dealership Pendragon sent its shares down 18%. Pendragon said its business was suffering in the wake of falling demand for new cars: "The decline in demand for new cars and the consequent used car price correction has impacted this year's profit outturn." The company, which owns the Evans Halshaw brand, expected full-year profit to be about £60m, well below last year's £75.4m. Figures from the Society of Motor Manufacturers and Traders have shown new car sales falling for the past six months, with September showing a fall of 9%. Shares in rival dealership Inchcape fell 2.6%. On the currency markets, the pound was down 0.04% against the dollar at $1.3183 but was up 0.26% against the euro at €1.1225.